When you enter the showroom of Nelissen, you will soon notice that you can choose from bricks in different sizes. The format may seem less important than the colour or finish, but it still deserves some attention. In a bigger picture the size of the facing brick also determines the look of your project. The Module bricks are ±19 cm long and can be obtained with a height of ±5 cm or ±6.5 cm. Waal size bricks are ±21 cm long and can also be obtained with a height of ±5cm o ±6,5cm. Facing bricks of ±6.5 cm are ideal for high homes or large projects while bricks of ±5 cm give a more sophisticated look to the façade. The Roman format of Nelissen Brickworks has a length of ±21 cm and a height of ±4 cm. Thanks to the height-length ratio, your façade gets a linear, very modern look. Nelissen Bricks has introduced a very exclusive size of facing bricks, the N70, available in a height of ±4 or ±5cm. More information can be found here. Nelissen Bricks now also produces a number of colors in the new size NNF (240x107x72 mm): T15, T16, Dali, Moreno, Lava and Borlo Sintered. Nelissen Brickworks has been providing facing bricks of the highest quality for 4 generations. Under the motto “a brick for each style”, Nelissen offers a wide range of bricks for every style: classic, modern, presbytery or contemporary houses. All of this in 75 different colours and 8 different sizes. The Nelissen bricks are suitable for both traditional masonry and modern techniques such as gluing or bricklaying with thin-bed mortar. Hand-moulded facing bricks have a unique shape and colour. Previously, hand-moulded bricks were really shaped by hand, but today they are manufactured with the most modern machinery. With the oldest method, the hand-moulding technique, a quantity of clay was thrown in a wooden mould, which was first sprinkled with sand. The top is stripped and covered with a steel drying plate. Then the mould is reversed and the unbaked brick falls out of the mould. The modern production process imitates the actions and methods of the former professionals. Hand-moulded facing bricks are not smooth and tight, but rather rough. Because of their unique look they are indistinguishable from old stones. These facing bricks are characterized by their outdated view, but these are made of new bricks that have gotten an additional treatment. These stones offer the ideal alternative for recuperation bricks. Aged facing bricks are perfect for any style (presbytery, contemporary, classic, farmhouse style …) and they often offer the best solution for renovating your house or project in an aesthetic way. 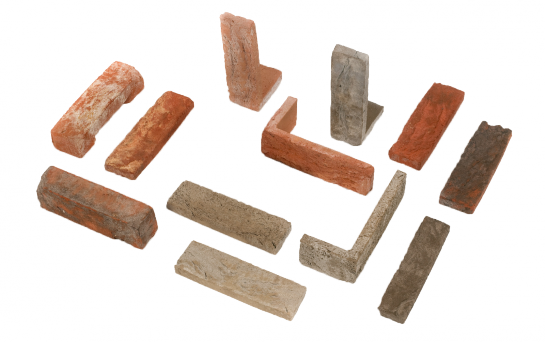 To tumble bricks, the bricks are thrown into a cylinder. The edges rub against each other and thus, the corners are being rounded and slightly broken. The bricks get an irregular shape and thus a rustic character. They now look more like recuperation bricks, but yet they have all the good physical properties of new bricks. 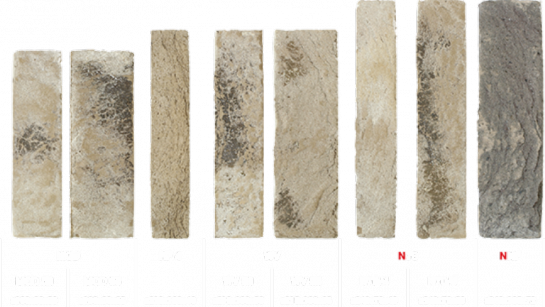 The facing bricks of the Koloro series have a cement coating. after processing and with a customised joint a coated facade is obtained. If you want a brick with a dark shade of grey, then it is best to choose braised facing bricks. That way you give your home or building project an intense, warm and creative atmosphere. When braising the bricks, previously baked bricks go into the oven again. The high temperatures cause a chemical reaction in which the present iron oxide fade from red to grey or from pink and yellow to lighter shades of grey. Moulded bricks differ by their smoother texture of hand-moulded bricks; the typical grain is missing here. They are sanded, just like the hand-moulded bricks, but their shape is more regular and they have a smooth surface. These bricks are ideally suited for modern projects and houses. Just like the hand-moulded bricks, the moulded brick is formed in a mould. Contrary to the hand-moulded brick, by which clay is mechanically thrown into the mould, a moulded brick is formed by clay under a certain pressure that is pressed into a pre-sanded mould by a press block. This creates a brick with a smooth and sleek surface with angular sides which are sanded on five of the six sides. Wasserstrich bricks are sleek and have a scraped surface texture without a sanded coat. These bricks owe their name to a special technique used during the manufacturing. Instead of sand in the mould, a small jet of water (“Wasserstrich”) is sprayed into the trays in order to get the clay bricks out of the moulds. This process makes the natural colour of the clay pretty visible and therefore the facing brick gets a soft, nuanced tone. The Wasserstrich bricks alow a very modern and vibrant architecture with bright colour shades. 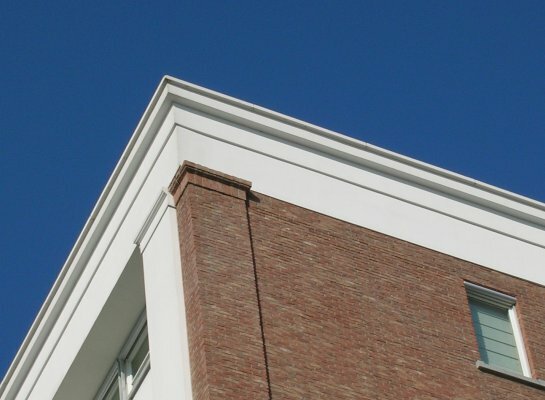 With brick slips or half bricks, an existing façade can be given a complete “makeover”. These bricks can also be used for new or industrial buildings. Slips and half bricks are cut out of the original facing bricks on request. Therefore they have the same characteristics and quality as full bricks. However, they are lighter and more convenient when processing. Half bricks are approximately 4.5 cm to 5 cm thick, while brick slips are only ±2 cm thick. Brick slips are always glued with specially designated (mortar) glue. Due to the thinness of a brick slip, the normal detailing of windows and doors can be maintained when applying these bricks. That way you can avoid high adjustment costs. For the corner cut on walls, window and door openings, there are special corner strips, through which the selected connection does not change and a perfect finish can be guaranteed. Half bricks however are being cemented against an existing wall. The corners are done exactly the same with half bricks and full bricks. The entire range of Nelissen is available as brick slip or half brick. ISO•Façade is a complete system for both new buildings and renovation projects, by which you insulate your façade and give it a total new look in one single process. A moulded brick is a brick that has a different profile compared to a standard brick.These bricks provide special effects on the façade; this makes it possible to spend extra attention to a project.  On the basis of a correct outline we manufacture the most complicated bricks for architects and building artists. Unlike the ordinary standard bricks, produced by machines, the moulded bricks are still made by hand. For the standard models the moulds are already available. Moulded bricks between 50 mm and 65 mm can be obtained at short notice in almost any colour of the wide range. Other sizes and measurements are delivered within 6 to 8 weeks from your order. Nelissen Eesti on Belgia Nelisseni tehase ainuesindaja Eestis. Nelisseni tooteid müüakse Eestis alates 2005 aastast. Meie toodangu hulka kuuluvad kõrge kvaliteediga ökoloogilised 100% savist valmistatud tellised, tellisplaadid, poolikud ja erimõõtmelised tellised, nurgaplaadid ning vuugisegud.